The following accounts, written by two early fifth century historians, recall the third exile of Athanasius the Great during the reign of Constantius. Through the influence of the Eusebian faction at Constantinople, an Arian bishop, George of Cappadocia, was now appointed to rule the see of Alexandria. Athanasius, after remaining some days in the neighborhood of the city, finally withdrew into the desert of Upper Egypt, where he remained for a period of six years (356-362 AD), living the life of the monks, devoting himself to the composition of a group of writings: "Apology to Constantius", the "Apology for his Flight", the "Letter to the Monks", and the "History of the Arians". 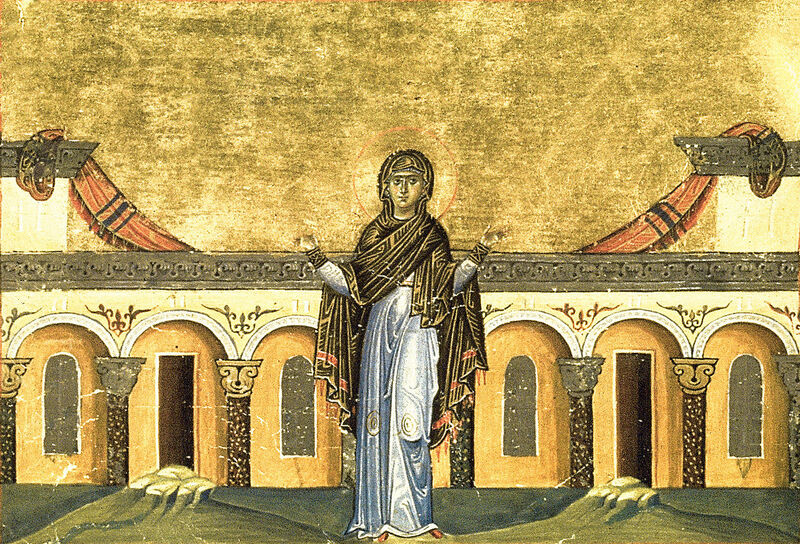 According to tradition, the identity of the beautiful virgin ascetic who hid St. Athanasius during these six years (which Palladius mistakenly numbers 30 years) was St. Syncletike of Alexandria (Jan. 5). 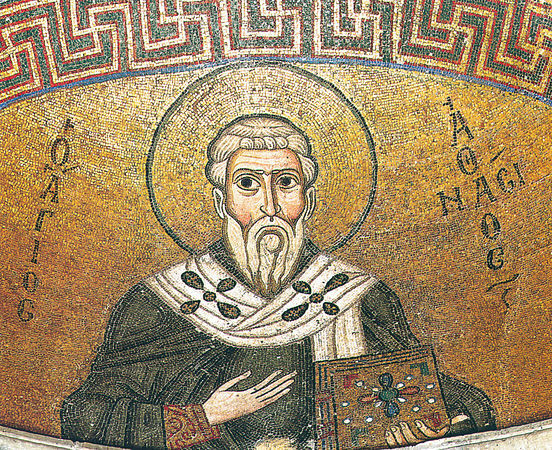 It is said that the Life and Sayings of St. Syncletike were recorded by St. Athanasius, and it is one of the most important spiritual texts of the Church. At this period, Athanasius, who had long remained in concealment, having heard of the death of Constantius, appeared by night in the church at Alexandria. His unexpected appearance excited the greatest astonishment. He had escaped falling into the hands of the governor of Egypt, who, at the command of the emperor, and at the request of the friends of George, had formed plans to arrest him, as before stated, and had concealed himself in the house of a holy virgin in Alexandria. It is said that she was endowed with such extraordinary beauty, that those who beheld her regarded her as a phenomenon of nature; and that men who possessed continence and prudence, kept aloof from her in order that no blame might be attached to them by the suspicious. She was in the very flower of youth and was exceedingly modest and prudent, qualities which are able alone to adorn the body even to a refinement of beauty when nature may not be helpful with the gift. For it is not true, as some assert, that "as is the body, so is the soul." On the contrary, the habit of the body is imaged forth by the operation of the soul, and any one who is active in any way whatever will appear to be of that nature as long as he may be thus actively engaged. After Athanasius had been preserved in this wise and appeared suddenly in the church, no one knew from where he came. The people of Alexandria, however, rejoiced at his return, and restored his churches to him. Now therefore it is necessary for us to remember also the chosen and mighty women unto whom God also gave an equal measure of strength of will as unto men, so that they might have no cause for being feeble in the performance of the labor of ascetic excellence. I have seen large numbers of widows who were exceedingly glorious and excellent in the performance of ascetic virtues, and among the chaste virgins whom I saw in Alexandria there was one whom I estimated to be seventy years old, and all the clergy testified concerning her that when a young woman, about twenty years old, she possessed exceeding beauty, and she was more looked at than many women, and because of her beauty she fled lest she should become the cause of stumbling unto men. Once when the Arians were plotting against the blessed Athanasius, the Archbishop of Alexandria, and were acting craftily in respect of him that they might do him harm through the prefect Eusebius, and through the wicked men who were his partisans in the days of the Emperor Constantine the Younger (i.e., Constantius), and were spreading abroad infamous reports about him, and were accusing him of many things which were unseemly for Christians to do, Athanasius fled that he might not be condemned in their wicked and corrupt hall of judgement, and he told no man, neither kinsmen, nor friends, nor ecclesiastics, nor any other men [where he was going]. And as soon as certain men from among the magistrates had entered into the episcopal palace suddenly, and begun to search for him and to inquire for him, he rose up at midnight, and took his tunic, and fled to this virgin who, being greatly astonished and struck with wonder at the matter, was moved exceedingly. Now therefore because of her exceedingly great joy she removed from herself and set aside all thoughts [of shame], and she became wholly [the servant] of our Lord, and she hid that holy man for the whole period of thirty years, that is to say, until the death of Constantine. She used to wash his feet, and she prepared everything of which he had need, and she attended to his bodily wants, and whatsoever he needed that she provided, and she borrowed books and brought them to him; and no man in Alexandria knew during that whole period of thirty years where the blessed Athanasius was.